I get so freaking fired up about the Baja 1000 every year because it’s the perfect beautiful blend of adventure, competition and amazing acts of automotive innovation. 2017 marks the race’s historic 50th anniversary, and live coverage should be better than ever. 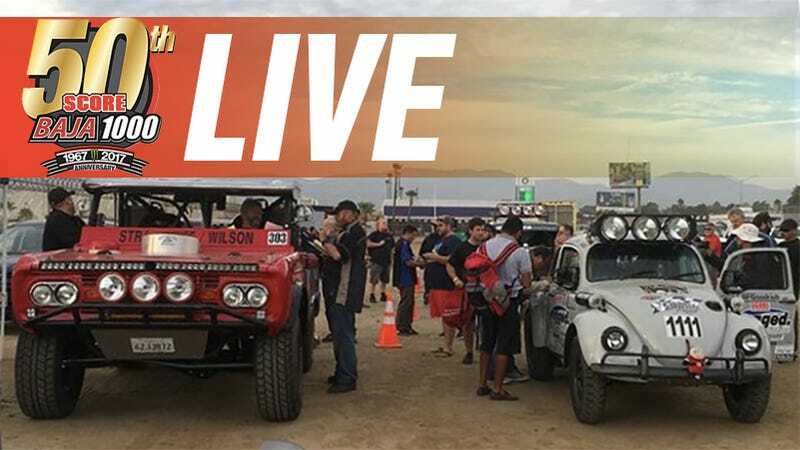 While Baja is just too damn remote to cover as comprehensively as an F1 or NASCAR event, the race sanctioning body SCORE has really stepped up its game in the quality of the live broadcast it’s beaming to the internet for free for the duration of the race. The 2017 1000 kicked off at midnight pacific time on Thursday Nov. 16 2017, so that the motorcycles could get a major head start on the 700-plus horsepower Trophy Trucks that take off at a more reasonable 10 a.m. Thursday morning pacific. The rest of the field, which is massive (over 410 competition vehicles are signed up in total), will launch every 60 to 30 seconds after that. A fully-produced television special about the race will air on El Rey Network in a few weeks, but if you want to keep up with the action as it happens, you’ve got a few options. If that Livestream Feed above isn’t working, try the one on the front of the SCORE International website. The broadcast is supposed to be bouncing between a feed at the starting line, command centers, and drone footage from along the course. To see where everybody’s at across the 1,100-plus mile course, use the Live Tracking system which is pretty self-explanatory. You should also be able to listen in on race happenings with the Weatherman Audio live stream. That’s basically like a police scanner for race operations, named after the Weatherman himself may he rest in peace. Finally, there should be additional coverage on the SCORE phone app and the race course has been laid over Google maps too. All the main characters that come around for every big Baja race like Robby Gordon, Apdaly Lopez, Rob MacCachren, BJ Baldwin and Bryce Menzies will be going fender-to-fender in high-dollar higher-horsepower Trophy Trucks. A few rungs lower in the competitive ladder, there are some other people you might have heard of in the mix as well: I’ll be navigating for a couple hundred miles in a what’s called a BajaLite, number 3003. It’s a tube-chassis vehicle dressed up to look like a pickup truck with a front-mounted 2.4-liter GM engine, rear-wheel drive and relatively small tires. My colleague-turned-rival Jason Torchinsky will be driving for a bit in what’s called a Wide Open Buggy, number BC-11. His car is an open-wheel rear-drive machine with a Subaru engine mounted behind the driver. Our friend Emmie Hall from CNET will be in a Class-11 Stock VW Beetle, number 1137, so, uh, wish her a lot of luck. Meanwhile, everyone’s favorite fast-talking hard-driving lunatic Bill Caswell kept telling me that the off-road BMW he was trying to build for last year’s Baja 1000 is ready but I haven’t seen him on the entry list. If he does get it done, he’ll probably be a in a Sportsman class, so keep your eyes open for him. You can see everybody on the entry list right here. Buen viaje to everyone out there this week!